A hundred thousand factually innocent men have been framed by police and prosecutors and imprisoned across this country. One of these men is Lorenzo Johnson. 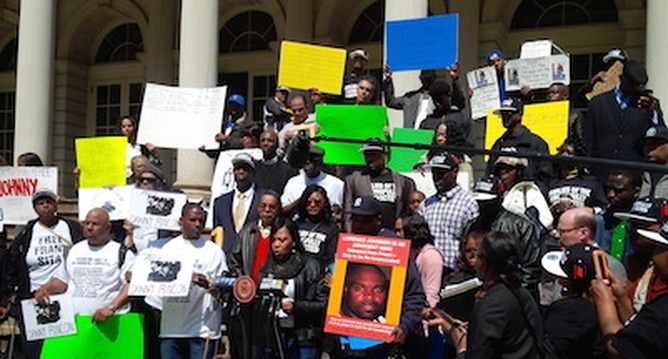 Over the course of Lorenzo’s incarceration, Team Free Lorenzo Johnson has been at the forefront of the campaign to bring not only Lorenzo justice, but justice to all who are wrongfully incarcerated. The campaign to free Lorenzo Johnson is part of the wider struggle to expose, publicize and fight the false convictions of so many innocent men and women in Pennsylvania and around the country. delivered to the Attorney General of Pennsylvania, Kathleen Kane, after new evidence of Johnson’s innocence surfaced – including his presence in New York City at the time of the Harrisburg murder, the identity of the actual killers, as well as police and prosecutorial misconduct. For more information on this press conference and the aftermath of the petition to the PA AG, read more here. “Greetings and support from my husband Lorenzo Johnson, an innocent man, sentenced to life without parole in Pennsylvania for a murder he did not commit eighteen years ago. He fought and won his freedom. The 3rd Circuit Ct of Appeals overturned his conviction. The court said there was insufficient evidence. Lorenzo was home for four months. But the state of PA appealed and the U.S. Supreme Court reversed and ordered him back to prison. My husband along with his friend Jeff Deskovic drove himself back to prison—to a sentence of life without parole. He had the courage to do that to fight for his exoneration and freedom. 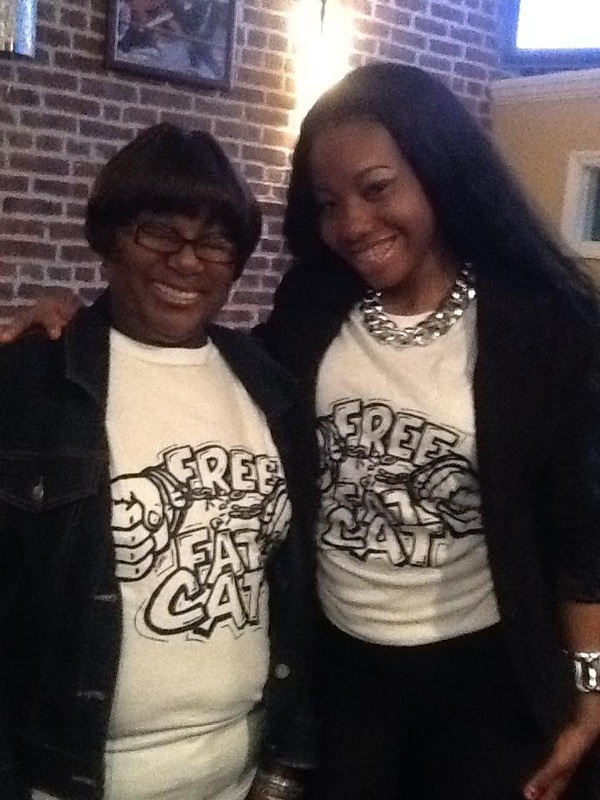 On April 30, 2013 there was a “Free Fat Cat” Rally and Fundraiser where dozens of supporters showed up proudly wearing “Free Fat Cat” t-shirts. The sounds of “Call to Free the Innocent! Free Lorenzo Johnson!” resonated from a May 29, 2014 rally in Harrisburg, PA. This rally was supported by the Freedom March for the Wrongfully Convicted from Western PA, Families of the Wrongfully Convicted in NYC, the Jeffrey Deskovic Foundation for Justice (NYC), HRC-FedUp (Pittsburgh), and the Abolitionist Law Center, among others. For more information this event, click here. 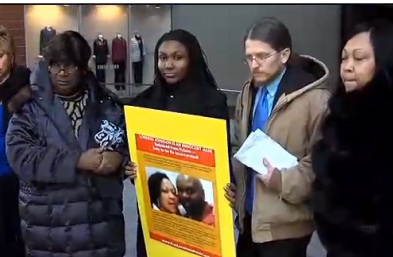 Friends and family of Lorenzo Johnson gathered in Harrisburg for a hearing on July 16, 2015 concerning Lorenzo’s co-defendant Corey Walker’s attorney. The hearing was stopped at 3 PM and a date for its continuance was not set, leaving Lorenzo wondering when – and if – he will ever get a trial to examine new evidence that proves his innocence. Read more about this hearing here. There are also a variety of Solidarity Statements and Commentaries that illustrate the overwhelming support – which is still growing – that is behind the Campaign to Free Lorenzo Johnson. You can read them here.